Asus ROG Strix GL753VD gaming laptop review: the perfect balance of performance and affordability? The Asus ROG Strix GL753VD gaming laptop isn't the most powerful gaming laptop in the world, however, it almost certainly is the most balanced in terms of price and performance, with the system delivering good core specs, plenty of well-realised features and an attractive, mature design for a sub-£1000 price point. That, in a nutshell, is the instant takeaway from this Asus ROG Strix GL753VD review. If you have £1000 or less to spend on a gaming laptop then the GL753VD should be at the top of your list. It is available from a wide-range of retailers, including Amazon with Prime delivery, and will easily satisfy all your PC gaming needs. For those who want more detail then read on. The first thing you notice when you open the Asus ROG Strix GL753VD's box and removed its protective baggy is is gorgeous brushed aluminium lid. The lid is black and cool to the touch, with the aluminium only interrupted by the Republic of Gamers logo, engraved in red, as well as a brace of go faster-style stripes (also red) running from bottom to top inwardly off-vertical. Open the lid and you are greeted with Asus ROG Strix GL753VD's chiclet, 4-area RGB, scissor-switched keyboard, as well as black touch pad. The entire keyboard surround - and indeed is true for the laptop's body in general - is made from plastic composite and, like the aluminium lid, boasts a brushed metal finish. Spacious palm rests sit either side of the touch pad, while the system's power button is embedded within the main keyboard array in the top right, maintaining a - aside from the keyboard itself - a button-less interior. Flip the laptop over and you are greeted with a rather standard sight. More black plastic, a series of orange-coloured feet to elevate the Asus ROG Strix GL753VD off its surface for improved airflow, and a series of downward-angled cooling vents and aluminium grills. There are no ports at all on the read on the laptop, with even the power port located on the rear left hand side of the machine. This adds to the systems minimalist (for a gaming laptop) aesthetic. Let's get to the juicy stuff. The Asus ROG Strix GL753VD comes packing a 2.5GHz Intel Core i5-7300HQ CPU, 12 GB DDR4 RAM and, most importantly of all, a DirectX 12-compatible NVIDIA GeForce GTX 1050 GPU with 4GB of GDDR5. Storage comes in the form of a Windows 10-holding 128GB SATA3 SSD, as well as a spacious 1TB 7,200RPM hard drive. Located on the right hand side of the system is a 8x Super Multi DVD-RW drive, which in the age of digital downloads was actually a pleasant surprise; anyone with a large classic PC gaming collection of disc-based games will be able to install them with no trouble. Also on the right hand side of the system is a brace of USB ports. Switch to the left hand side and things get a bit busier, with the lion's share of the machine's ports on display. Working from back to front you've got a power port, Ethernet port, HDMI port, mini DisplayPort, further brace of USB ports, USB3.1 Type C port and headphone jack. Move to the front of the system and you are greeted with nothing other than a SDXC/SD/MMC card reader and the laptop's speakers. Finally, moving onto the ASUS ROG Strix GL752VD's screen you find a 17.3-inch Full HD (1,920 x 1,080) anti-glare matte-type panel. This is a pleasing wide-angle affair that successfully manages to swallow glare and reflections, as well as deliver good contrast and colour consistency even at acute angles. 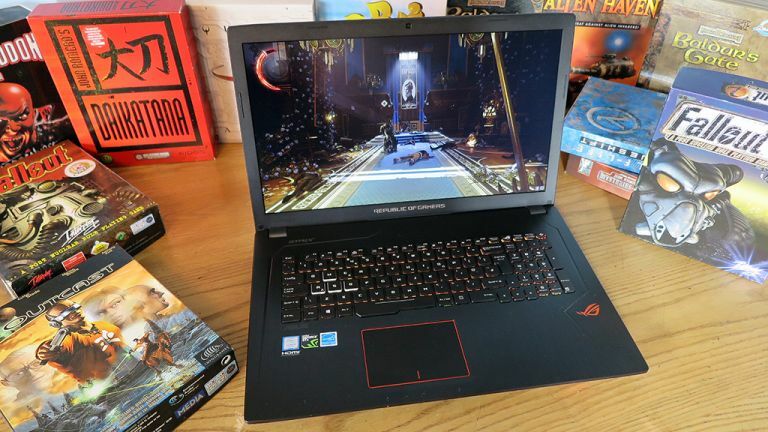 The first game we fired up on the Asus ROG Strix GL753VD was the absolutely awesome Dishonored 2. We've got to be honest, we were a little doubtful of the NVIDIA GeForce GTX 1050's ability to handle today's hottest titles without compromises being made, so we instantly cranked up everything to Ultra in the settings and then sat back and watched the introductory cinematic. The result? Into the game proper, with control of the character granted, and things remain just as slick. We can creep around and brutally murder traitorous guards in top detail and without any frame rate issues. Even when entering large areas filled with plenty of characters and shadows things remain slick, with only small frame rate disturbances coming when loads of particle effects (such as fog) are employed. Don't get us wrong though, these were minor dips and in no way affected playability; what they did highlight immediately though that ASUS was bang right keeping the screen resolution at 1080p, as clearly this card couldn't handle anything bigger while maintaining Ultra settings. Next up was the recently released hyper violent reboot of Doom. Again, flicking everything up as high as it goes we once more experienced almost no frame rate issues - with again things only taking tiny hits when particle effects were being thrown around left, right and centre or huge numbers of enemies were coming for us in large combat arenas. Prowling the dark corridors and wind-blasted martian landscape was definitely a slick and pleasurable gaming experience though. The colours popped from the screen, the pixels were pushed smoothly overall and, as we also learned when throwing a number of other titles at the Asus ROG Strix GL753VD, including the once GPU-slaying Crysis 2 (which itself was slayed totally by the 1050) and Mafia 3, the gunshots and environmental sound effects rang out with genuine umpf from the system's speakers. And speaking of which, the speakers on the Asus ROG Strix GL753VD - far from being tinny and completely useless (standard really on most gaming laptops) -actually had some real kick and bass to them. It was no chore to play titles without headphones and, even when the system's rather noisy fans were spinning at max speed, they delivered audio that was refreshingly meaty. Of course, we'd recommend you pair the GL753VD with a proper speaker system or gaming headset for sure, however, it was nice to see that if you went portable and didn't want to play with headphones on then you could and not have the immersion broken by awful audio reproduction. Of course, the Asus ROG Strix GL753VD had some things that were less than ideal. The battery life was below average for a system in its class, meaning that you basically need to always carry the system's power supply with you. This is no massive hardship as the power brick isn't huge, however, it is something you'd have to consider and would affect your usage. For example, you wouldn't be able to work unplugged on the system all morning and squeeze in 30-45 minutes gaming at lunch without then running a-cropper in the afternoon. You simply need to be plugged in really to game on the GL753VD. We also weren't too keen on the keyboard surround, which was spongy and didn't feel premium at all. This was a shame really as the rest of the chiclet, 4-area RGB, scissor-switched keyboard was good. Fan noise, inevitably, was also not great. At full blast the Asus ROG Strix GL753VD really pumps it out of its vents and we'd be lying if we said we didn't notice it, despite the better than average built in speakers. Heat as well is definitely something that you should consider as well as the GL753VD gets hot. This is not a system where you could comfortably game with it sat on your lap. It should be noted that you can tweak things like fan power in the pre-installed Asus Gaming Center tweak station, so if you wanted to run quiet during non-intensive tasks that option is available to you. Look, the Asus ROG Strix GL753VD isn't the most powerful gaming laptop in the world and it isn't a "dream system" so to speak - a Bugatti Veyron-style machine that costs a fortune and smashes everything else out there. So if you want the absolutely most kitted out, elite, 4K-crushing gaming laptop on the market today then the GL753VD is definitely not for you. No, if you've got those sort of demands and a King Midas-sized wallet to match then there are definitely other systems you can buy right now that outperform the GL753VD. But, and it is a big but, power at the expense (both literally and figuratively) of everything else really isn't helpful at all to the vast majority of gamers. No, what the majority want - including us here at T3 Towers - is great all-round performance at a decent price point. And that is what Asus has managed to achieve with the GL753VD - nothing it does is top tier, but Asus realised its limitations (evidenced by its partnering of the NVIDIA GeForce GTX 1050 with a 1080p screen rather than a 4K one) and designed a solid and balanced all round system that will provide great, if not elite, gaming action for years to come. For the money, we really don't know what more you could want from a gaming laptop. For more information about the Asus ROG Strix GL753VD then head on over to its official webpage now.